A major step in the operational development of the Airbus A220, the aircraft formally known as the Bombardier CSeries jet, occurred with the awarding of approval from Transport Canada for 180-minute extended operations (ETOPS*). 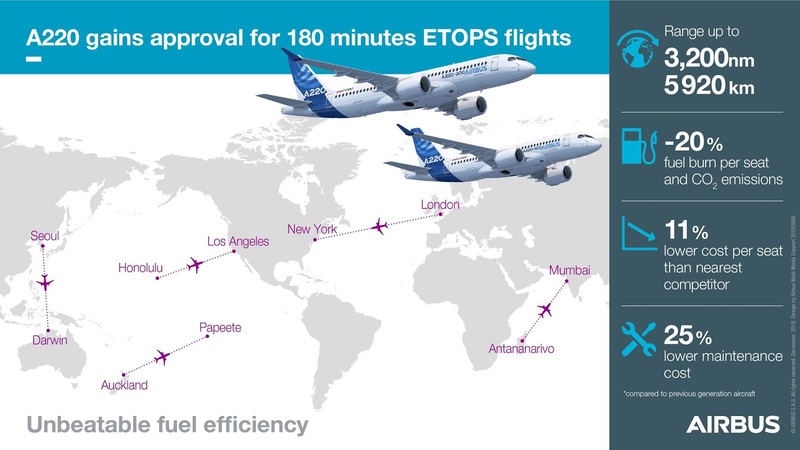 Yes, the newest addition to the Airbus family, the A220, has received 180-minute extended operations (ETOPS*) approval from the Canadian civil aviation authority, Transport Canada. This approval allows the A220 to be able to perform new direct non-limiting routings over water. It can now, operate up to 180 minutes from the nearest airport. This could mean that an airline might want to put an A220 on a route from London, or elsewhere in the UK to New York. Many might think that no airline would put a single-aisle small aircraft on a transatlantic route. But, the UK's British Airways has an all business class/club world Airbus A318 operating between London City Airport and New York's JFK. The aircraft has a 50-minute refuelling stop in Shannon on the way out, where passengers pre-clear US customs. The A220 already has the ability to operate in and out of London City Airport, so maybe in the not too distant future, we could see the type crossing the Atlantic. As the only aircraft purpose-built for the 100-150 seat market, the A220 delivers unbeatable fuel efficiency and true widebody comfort in a single-aisle aircraft. 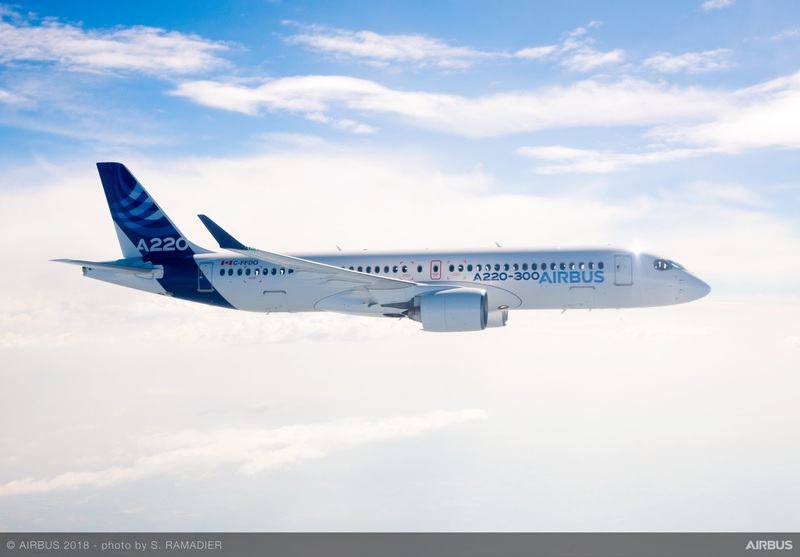 The aircraft brings together state-of-the-art aerodynamics, advanced materials and Pratt & Whitney’s latest-generation PW1500G geared turbofan engines to offer at least a 20% lower fuel burn per seat compared to previous generation aircraft. With a range of up to 3,200 nautical miles (5,920 km), the A220 offers the performance of larger single-aisle aircraft. *“ETOPS” is a set of rules initially introduced by International Civil Aviation Organisation (ICAO) in the mid-1980s to allow commercial operations with twin-engine aircraft on routes beyond 60 minutes flying time from the nearest airport and which were previously operated only by aircraft with more than two engines. 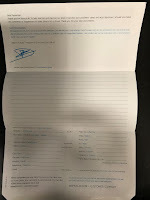 These rules, which are now named “EDTO” (Extended Diversion Time Operations) by ICAO have been progressively revised to allow operations up to or beyond 180 minutes diversion time.